Zack is a handsome 3 1/2 year old who is described as active, and adorable. Zack loves music and enjoys singing and dancing. He can be shy, but he gets along very well with his peers and teachers and warmly greets those familiar to him. He also loves to jump and enjoys playing catch. Zack goes to school in the orphanage. 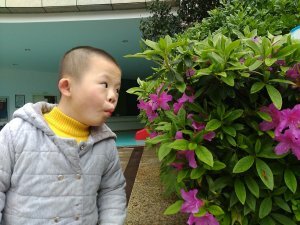 He is in class with other children with Down Syndrome, in which he is considered above average. He has language skills, good fine and gross motor skills, and he knows his numbers, colors, and sizes. Zack can speak common characters, words, and short sentences.